Are you looking for some fantastic team shorts that actually make a statement? Not the same ones everyone else is wearing, but shorts that really stand out? Then let Shop4teams help you customize your team’s look. As a leading provider of adult athletic shorts, we have designed custom athletic uniforms for teams all over the country. Now, we’re ready to help customize the shorts for you and your team. At Shop4teams, you can customize the shorts for any club, group or sport. Bring us your ideas for custom athletic shorts, and we’ll immediately get to work helping you create something exciting and unique. Let your club or team shine in shorts the competition has never laid eyes on before. Whether you choose to use your team or school logo or want to start entirely from scratch, Shop4teams will make a custom and unique come to life for you. Browse through our online catalog of team athletic shorts and you’ll see that Shop4teams does not settle for products that are not top notch. 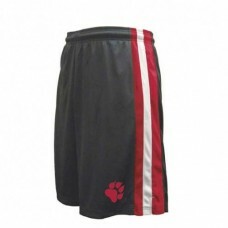 Our customizable team shorts come only from the top manufacturers of the team apparel industry. Companies like Holloway, Augusta, High Five and Badger. The secret to our success is made by refusing to use second rate products. And we have shorts for everyone: Shorts for adults, Shorts for ladies, Shorts for youth, Shorts for girls, Shorts in all sizes and Shorts in all colors. Whether your team needs shorts for the new season or your school needs a line of athletic shorts for the spirit store or gym class uniforms, Shop4teams is surely to have just the right shorts for you! Size chart 100% polyester wicking knit with true hue technology™ that helps prevent dye migrati.. Size Chart Dry-Excel™ 100% polyester wicking knit * Dry-Excel™ Snowy heather fabric side inse.. Size chart smooth performance fabric · "fadeout" sublimated side panels · wrap around back panel · s.. Size chart Graphite performance mesh. "meteor" sublimated side stripes. Side pockets.. Size chart 100% polyester wicking smooth knit * 100% polyester wicking mesh inserts * Odor resistant.. Size chart Dry-Excel™ Micro-Interlock has a smooth polyester surface with high mechanical.. Size chart Dry-Excel™ 4-way stretch mesh provides ventilation and comfort Micro-Interlock, .. Size chart . Dry-Excel™ Fresh Micro-Interlock, polyester knit with wicking and odor resistant proper..